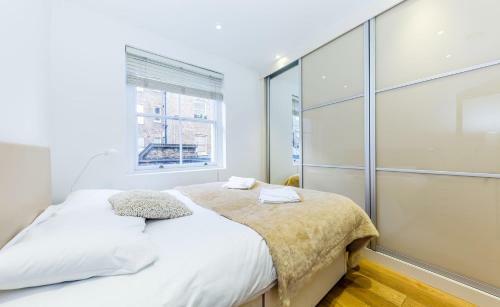 Regents - Cosy 1 Bedroom Flat Central London in London is an apartment building. Situated in London, near Oxford Street and Dominion Theatre, Regents - Cosy 1 Bedroom Flat Central London features free WiFi. Each unit comes with a microwave, toaster, a coffee machine, as well as a fridge and kettle. Guests wishing to travel lightly can make use of towels and linens for an additional supplement. Carnaby Street is 1.7 km from the apartment, while Piccadilly Theatre is 1.8 km from the property. London City Airport is 17 km away, and the property offers a paid airport shuttle ser...vice. Situated in London, near Oxford Street and Dominion Theatre, Regents - Cosy 1 Bedroom Flat Central London features free WiFi. Each unit comes with a m...icrowave, toaster, a coffee machine, as well as a fridge and kettle. Guests wishing to travel lightly can make use of towels and linens for an additional supplement. Carnaby Street is 1.7 km from the apartment, while Piccadilly Theatre is 1.8 km from the property. London City Airport is 17 km away, and the property offers a paid airport shuttle service. When would you like to stay at Regents - Cosy 1 Bedroom Flat Central London? A damage deposit of GBP 250 is required on arrival. This will be collected as a cash payment. You should be reimbursed on check-out. Your deposit will be refunded in full in cash, subject to an inspection of the property. Please inform Regents - Cosy 1 Bedroom Flat Central London in advance of your expected arrival time. You can use the Special Requests box when booking, or contact the property directly with the contact details provided in your confirmation. Guests are required to show a photo identification and credit card upon check-in. Please note that all Special Requests are subject to availability and additional charges may apply. Please note, the lead guest must be 25 years of age and older.